This is my first blog post since January of 2013. A LOT has changes but I always depended on SparkPeople.com to be ther when I needed it. And it's cool to see the people whose blogs I read three years ago are still blogging! Updates. I'm married. No kids (although who knows what the future holds). I'm in NURSING SCHOOL and I've moved twice since my last blog post. What else? I'm obsessed with this boot camp I've been going to for almost two years. It's amazing. Being in nursing school makes living healthy very hard. But my goal with returning to this blog is to help anyone else who feels like they're stuck in a rut with healthy living, who has a crazy schedule and no time to cook, or anyone who just feels like they're not sure what to do next. Not sure what this will be. Maybe photos of what I'm making for dinner, and REAL admissions of having a bad night. If I eat out and know I made a bad choice I'm going to be honest about it. Maybe together everyone can just admit no one is perfect when it comes to living a healthy life and we can just admit to screwing up and moving forward. That's all for now. Have to go to a 3 hour lecture on Nutrition in Nursing. 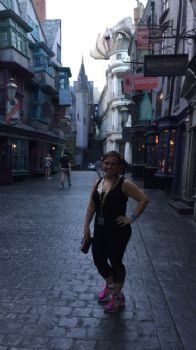 This is the most recent pic of me in my favorite place on earth, Diagon Alley. 158 lbs.